The United States is a rather large country and it’s chock full of desirable locations that you can visit. Some are sprawling metropolis and others are quaint country towns, but none of them are quite like Alaska. When people picture Alaska, it’s doubtful that they picture much more than a glacier crusted wasteland of ice and not much else. However, Alaska is completely the opposite of this. It’s lush and green, full of wildlife and endless possibilities for breathtaking adventure. This is why our founder Kamell (aka The Duke) settled on building J-Dock Sports Fishing in the cozy town of Seward. Because when you’re in Alaska the adventure is always centralized, you won’t have to travel far to see something you’ve never seen before. Alaska is known for being the Northernmost territory of the United States. And for this reason, many imagine lots of snow and not much else. But Alaska is covered in stark contrast. From the lush, emerald green of the trees, to the varying gold hues of the grasses, to the towering steely blue of the mountains, Alaska is a land of vivid views and stunning landscapes. One of the main reasons to travel to Alaska is to truly experience the last frontier. There are very few areas in the main section of the United States that offer such stunning beauty with hardly any interruption from manmade artifacts. The charm of the Alaskan coast can be totally viewed at its height via a coordinated charter fishing trip. 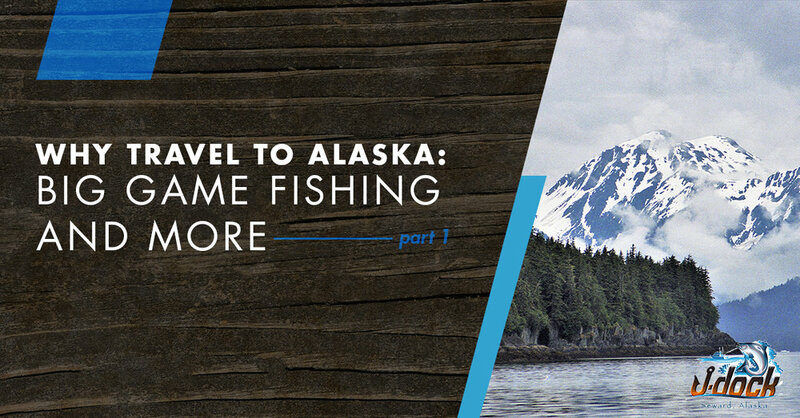 Slide by towering glaciers where they come down to meet the sea, or watch the green of the pine trees fade into craggy cliffside that glints in the sun like precious stone all while pulling the largest halibut you’ve ever seen onto the deck of your fishing boat. Because there are huge portions of Alaska that remain entirely untouched by man, hence the name “The Last Frontier,” there are animals everywhere. Not just fish either, although Alaska’s chartered fishing trips call fishermen from all over the world to our icy green waters. One of the really amazing parts of being in Alaska is how likely you are to see random wildlife merely meander across your path. From a moose on a trail to bears frolicking in the river, it’s entirely likely that you’ll see the sort of mountain wildlife that you can rarely see anywhere else. One of the many things that Alaska offers beyond just random wildlife sightings are is the more calibrated opportunities, like going whale watching. Alaska offers one of the only chances you can have to go out and watch some of the most majestic underwater life forms in motion out on the open water. In our opinion, watching animals out in the wide open air fills you with the same incredible sense of freedom that Alaska invokes in everyone who visits. Don’t just take our word for it. Come get a taste of the freedom that makes Alaska into the frontier everyone wants to explore. From tumbling and crumbling glaciers to pulling huge vibrantly colored fish from the depths of the cold sea, you’ll certainly find an Alaskan trip through J-Dock Sports Fishing to be much more than simply rewarding. Our Charter fishing and big game fishing packages can include everything for your stay, including lodging, transportation, world-class quality food and we’ll overnight ship your fresh caught fish back home so you can enjoy it immediately. Interested in doing more than just fishing? Don’t worry, we can act as your home base and help you schedule some of the most incredible excursions for your trip. Contact us to book your adventure now.